In March, President Obama signed an order removing some curbs on federal funding for embryonic stem cell research. Washington (CNN) -- Thirteen new human embryonic stem cell lines have been approved for use in federally funded research -- the first to be approved under an executive order from President Obama -- the National Institutes of Health announced Wednesday. Under the administration of President George W. Bush, federal funding for such research was limited to cell lines created before August 2001. Obama issued an executive order in March repealing that policy and ordering the NIH to adopt guidelines for the creation of new stem cell lines and their use. "I am happy to say that we now have human embryonic stem cell lines eligible for use by our research community under our new stem cell policy," said NIH Director Francis Collins. "In accordance with the guidelines, these stem cell lines were derived from embryos that were donated under ethically sound informed consent processes. More lines are under review now, and we anticipate continuing to expand this list of responsibly derived lines eligible for NIH funding." The NIH said 11 stem cell lines from a lab at Children's Hospital in Boston, Massachusetts, qualify for federal funding, as do two lines developed at New York's Rockefeller University. "An additional 20 more lines are being considered by the NIH advisory board on Friday," Collins said. He said the NIH has received 109 applications for federal funding so far, including these 20 to be looked at by the end of this week. Collins told reporters in a conference call that the goal is to quickly move forward in the approval process so research in this field can expand. 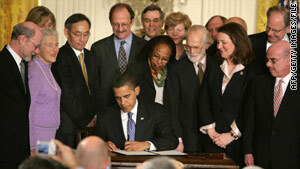 On March 9, 2009, Obama signed an executive order that changed the rules on federal funding for human embryonic stem cell research. The new rules removed the restrictions set by the Bush administration, which limited federal funding to 60 stem cell cultures that were developed before August 9, 2001. Human embryonic stem cells are believed to have the potential to develop into any type of cell in the human body. However, because they are harvested from embryos left over from fertility treatments, and removal of the stem cells destroys the embryo, the promise of the research has been mired in controversy. On July 7, the National Institutes of Health published guidelines that researchers must meet in order to apply for federal funding for this type of research. Under these guidelines, stem cells harvested in laboratories that were privately funded are now eligible for federal research dollars, something that wasn't possible under the Bush administration's rules. During his administration, George W. Bush restricted funding on stem cell research, saying that scientific advances allowed researchers to conduct groundbreaking research without destroying human embryos. But in signing his executive order, Obama disagreed. "In recent years, when it comes to stem cell research, rather than furthering discovery, our government has forced what I believe is a false choice between sound science and moral values," Obama said at the White House. "In this case, I believe the two are not inconsistent. As a person of faith, I believe we are called to care for each other and work to ease human suffering. I believe we have been given the capacity and will to pursue this research -- and the humanity and conscience to do so responsibly." The president pledged to develop "strict guidelines" to ensure that such research "never opens the door to the use of cloning for human reproduction."